The former Villa striker’s only foray into management was a brief stint as Trinidad and Tobago assistant manager. 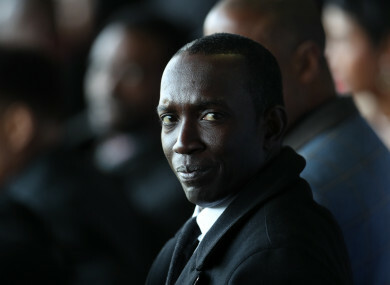 Former Aston Villa and Manchester United striker, Dwight Yorke. DWIGHT YORKE RECKONS he’s the man to return Aston Villa to former glories as he put his name into the running to succeed Steve Bruce as manager. The club’s former striker has little experience in the area, his only foray into management being a brief stint as Trinidad and Tobago assistant manager between 2009 and 2010. His lack of experience, however, has not deterred him from dusting off his résumé and attempting to secure an interview for the position. “I’ve made the necessary move and I’ve sent in my CV and I’m actually trying to make contact with the chief executive of the football club,” he told Sky Sports on Friday afternoon. “I’m doing everything on my side to make sure I’m given that opportunity to speak to them. “It’s a job I’m 100% interested in, I’ve made it very clear I’d like to speak to the football club. Steve Bruce was this week sacked by Aston Villa after winning just three of their opening 11 games of the season. Of late, the club had endured a run of just one win in 10 matches in all competitions. Their misery was compounded on Tuesday night when Yannick Bolasie snatched a point for the club in the final minute, despite leading basement side Preston 2-0 at half-time. The calamity at Villa Park was the final straw and Steve Bruce was relieved of his duties on Wednesday. Bruce had led the club to the brink of a Premier League return last season, but fell short in the play-off final with a 1-0 defeat to Fulham. Despite scaling such heights, Yorke says the club need something fresh and new. “I’ve seen the club go from a very strong club in world football to where it is at the moment. I’ve felt that the club do need something a bit new. “I’ve spoken with Tim [Sherwood, former Aston Villa manager] and asked him what was the matter with the club. “He gave me an insight into what he might have failed on and not got right, so having that knowledge from Tim does give me more of an insight in what is needed at the football club. “Aston Villa need something new. I played for them and understand the club and understand what the fans expect. Yorke spent nine years with the club, making 232 appearances and scoring 73 goals before moving to Manchester United prior to their treble-winning season. Shakhtar Donetsk manager Paulo Fonseca has been in the conversation to replace Bruce due to his connections with those on the Villa board. Other names include Belgium assistant boss, Thierry Henry. Email “'I can bring a winning mentality back to the club' - Dwight Yorke keen to land Aston Villa job”. Feedback on “'I can bring a winning mentality back to the club' - Dwight Yorke keen to land Aston Villa job”.